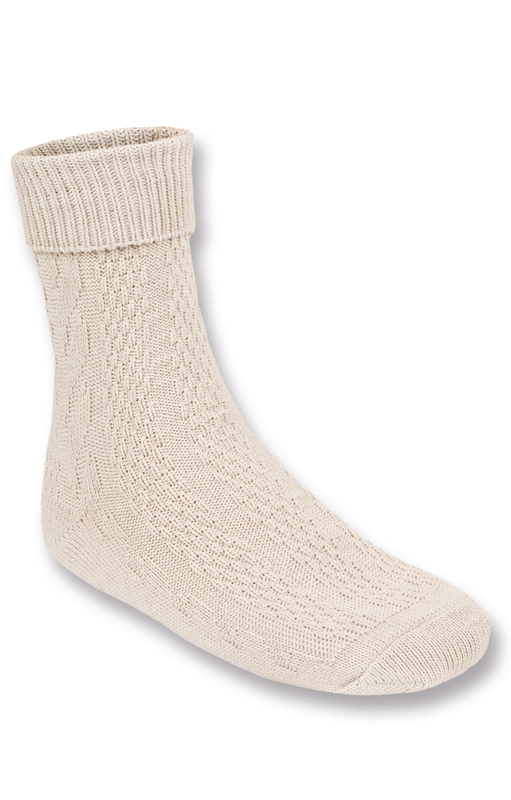 Traditional costume haferl socks 26010 natural-coloured. What would the traditional haferl shoes be without a proper pair of haferl socks? Haferl socks match the traditional haferl shoes perfectly, and should be worn whenever the popular shoe is chosen as part of a bavarian or austrian traditional costume outfit. In modern traditional costume fashion, they are also worn with other shoes and boots, and always make for a great outfit when combined with ankle boots or leather boots. Haferl socks have been part of the bavarian and austrian traditional costumes for centuries, and are made of classical materials and produced in a traditional way to this day. In terms of quality and style, there simply is no match for haferl socks! Gute Qualität, kein unerwünschtes "Rutschen", auch bei stundenlangem Tragen hoher Komfort! Fallen sehr gut aus. Jederzeit wieder.